levitated King Boris of Borsovia with a magic spell. King Boris, Rubina, Pongo, Lord Chamberlain. courtesy Gordon Murray. Copyright © Gordon Murray, 1977. With the dissolution of the BBC’s Puppet Theatre in 1965, nothing further happened with Rubovia for about nine years. Then following in the stop-motion footsteps of his highly-successful Trumptonshire programmes, Gordon Murray at the BBC’s request agreed to remake some of his old black and white “Rubovian Legends” marionette plays in colour, with newly designed stop-motion puppets and settings. Based on the same scripts, this latter series was to be “dumbed down” for a younger audience, and was to be simply called “Rubovia”. Although not intended for an audience quite as young as the ‘Watch with Mother’ crowd (it proved impossible to simplify the scripts quite that much), the stop-motion “Rubovia” episodes had watered-down dialogue and situations, and used the same type of ping-pong ball stop-motion puppets that had proven so successful in Trumptonshire. Yet even though “Rubovia” followed in the footsteps of Trumptonshire, and used similar production methods, the new series did not prove to be as enduringly popular, and once a couple of repeat runs during the late 1970s were finished it simply “disappeared” from the public’s memory. Gordon said that was that was to be expected. He had objected to the ‘Watch With Mother’ timing, saying that unlike Trumptonshire, which was designed for the three-to-four year olds, it was never his intention that the BBC should run “Rubovia” in such an early time slot. The BBC nevertheless thought that they knew best. Whether the the stop-motion Rubovia series might have worked better in a later time slot, for example 4:00 - 5:00 pm to catch the after-school audience, we’ll never know for sure. What we do know is that the “Rubovia” story-line went well over the heads of the three-to-four year old ‘Watch With Mother’ audience. Other things were stacked against the stop-motion “Rubovia” series too. Even though filmed in colour, the stop-motion puppets were much less life-like than the original “Rubovian Legends” string marionettes, and not nearly as engaging. 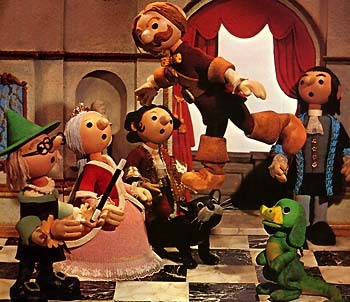 In addition, not only did the new series lack the sparkle of Andrew Brownfoot’s brilliant costume and set designs used in the original marionette series, but it also lacked the expressiveness of the original foam rubber latex faces, not to mention the chemistry that existed between the voice actors, Derek Nimmo, Roy Skelton, James Beattie, and Violet Lamb. Roy Skelton (who was the voices of the Lord Chamberlain and King Boris in the original series) nevertheless very skillfully did all of the character voices for the stop-motion puppets, while Gordon himself handled the narration. Predictably, the programmes fell short of the results achieved with the original marionettes. If you can acquire a copy of the BBC Rubovia LP (which contains the soundtrack for two episodes of the stop-motion TV series), you can listen and make up your own mind on the point about the appropriate age group it should have been aimed at. We have done this, and agree with Gordon that seven years old would be the appropriate target audience. In any case, the 1976 stop-motion Rubovia series ran for only half the usual number of episodes for a series, which is a definite indication of lack of popularity. Contrast this with Trumpton et al., which ran for three series totaling 39 episodes. The earlier B&W marionette-based “Rubovian Legends” series, on the other hand, had been very successful, attributable as much to the quality of the stories, voices, puppets, puppetry, costumes and settings, as its 5:00 - 6:00 pm time slot. Based on Gordon Murray’s prior success with making Trumptonshire for the ‘Watch With Mother’ time slot, it is a great shame that Gordon’s advice about showing the stop-motion Rubovia series later in the afternoon, and not to pre-schoolers, was not taken. At the very least, one of the repeats could have been scheduled in a later timeslot to to see if the old Rubovia magic (=audience ratings) would reappear. Perhaps the stop-motion Rubovia series could still be saved if it were to be released on home video. It would fit in well as a future extra to Gordon Murray’s similarly-styled Trumptonshire stop-motion series, which was released in the DVD format, to great fanfare, in 2002. As for the older B&W “Rubovian Legends” episodes, they unfortunately have not seen the light of day since 3rd January 1966 when Trumptonshire first flickered into existence on our television screens. Their deservability for a good DVD release is beyond question.